The earliest communities of faith shared everything in common. Today the church endeavors to continue that legacy of caring for people’s spiritual and physical needs, reaching out to our local community and beyond. But the wherewithal to care, and do that outreach, comes only through your generosity, whether you share it twice or fifty-two times a year. Your gift helps this church do its part in healing this broken world. Every Christmas, we designate all or a portion of collected gifts to a specific group or cause. Half of the Christmas offering has been added to the Pastor’s Discretionary Fund; this is our church’s “Samaritan Fund” to assist those coming to the church with emergency needs. 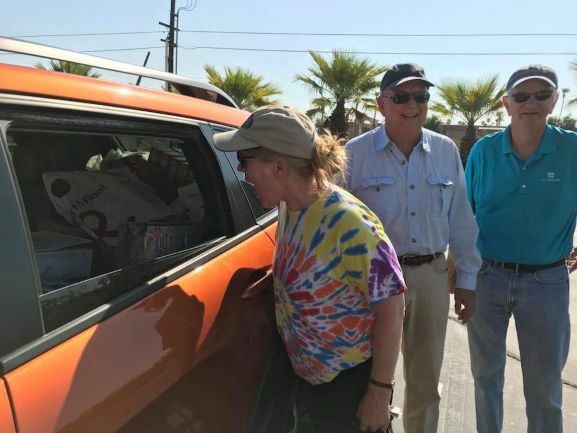 The other half of the offering (around $2,500) was sent to support “The Border Church,” a United Methodist ministry shepherded by Rev. John Fanestil of FUMC San Diego. The Border Church brings Christ’s love and care to the San Diego/Tijuana border at two sites: Border Church/El Faro celebrates communion and offers a community meal each Sunday afternoon at Friendship Park, the historic border meeting place overlooking the Pacific Ocean; Border Church/El Chaparral serves migrants near the San Ysidro Port of Entry through the middle of the week offering meals, supplies, showers, day-lockers, and assistance in the form of counseling and social work. For more information on the Border Church, visit its Facebook page..
After the Cranston Fire that wreaked havoc in Riverside County in late July and early August 2018, the church held a special offering to collect money to support our neighbors. Some wonderful volunteers and our own Pastor Jane used the money, a little over $600, to buy food for the food pantry at Idyllwild Help Center. REALM is the web-based church software that we are using for many of the administrative needs of the church. If you regularly attend our church, you can use REALM for online giving, church directory, and keeping up with groups (e.g. Ministry teams, Sunday AM Class).